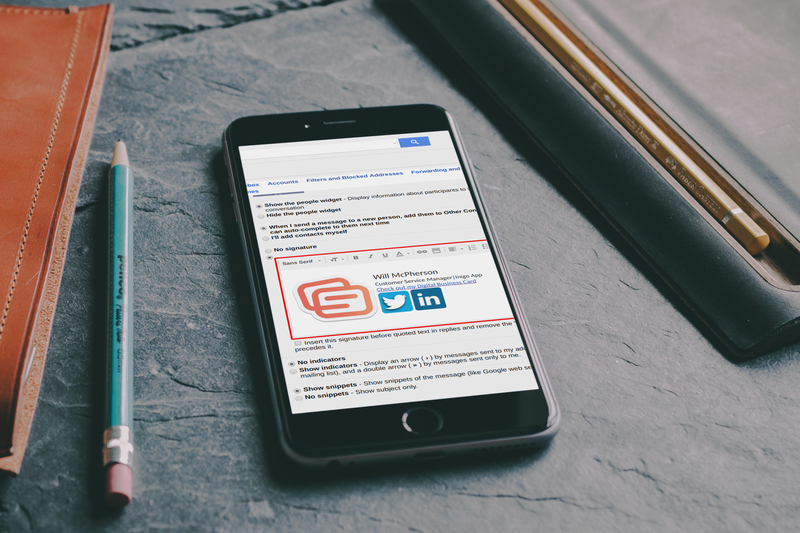 This article will show you how to add your digital business card to your email signature to help turn contacts into leads. 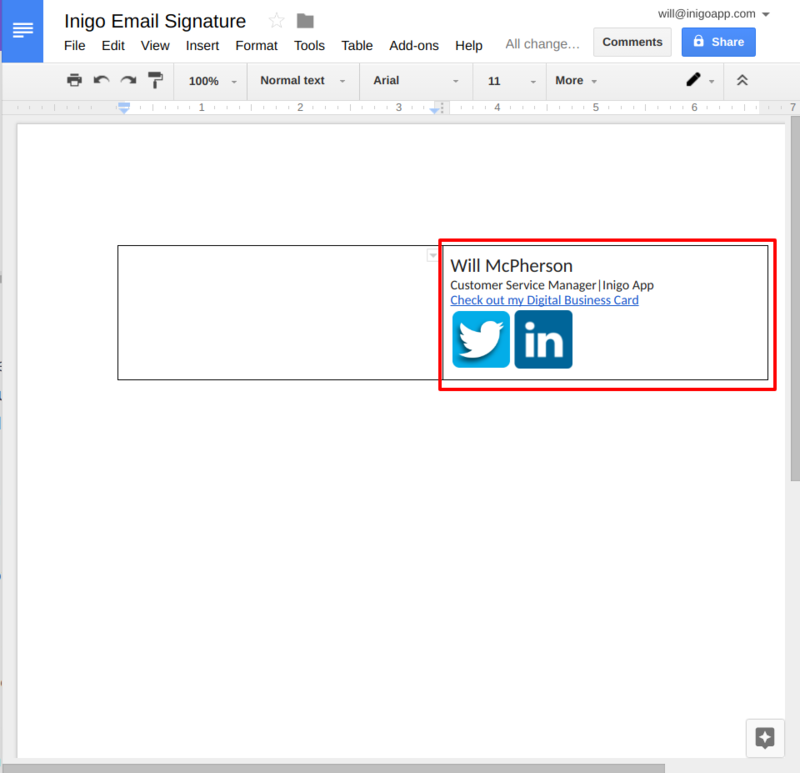 Add your Inigo Digital Business Card to your email signature to help contacts and clients view more information about your business quickly. 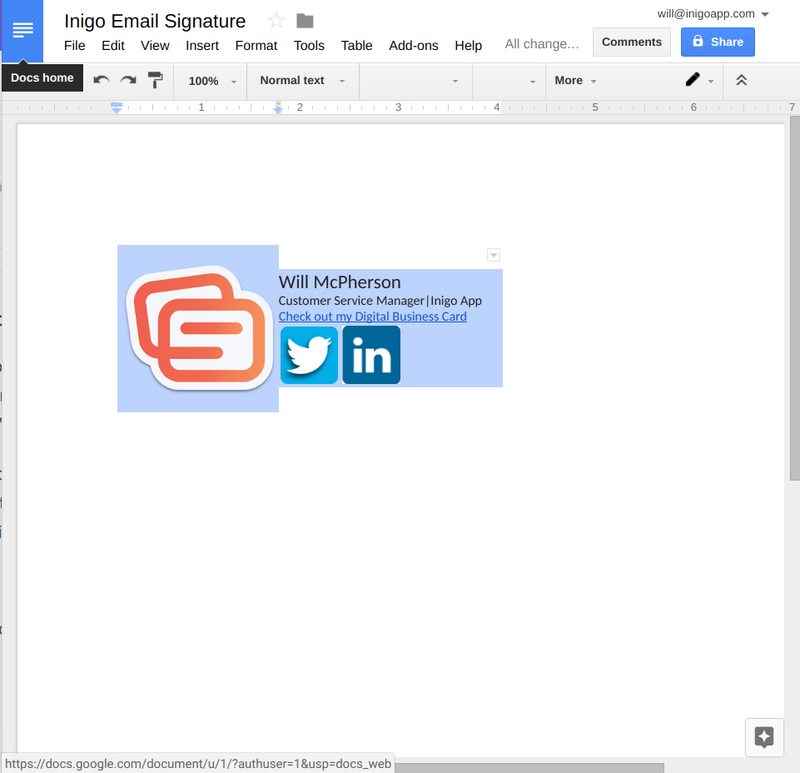 You can add an Inigo card to any email platform, but I will give the example for Gmail. 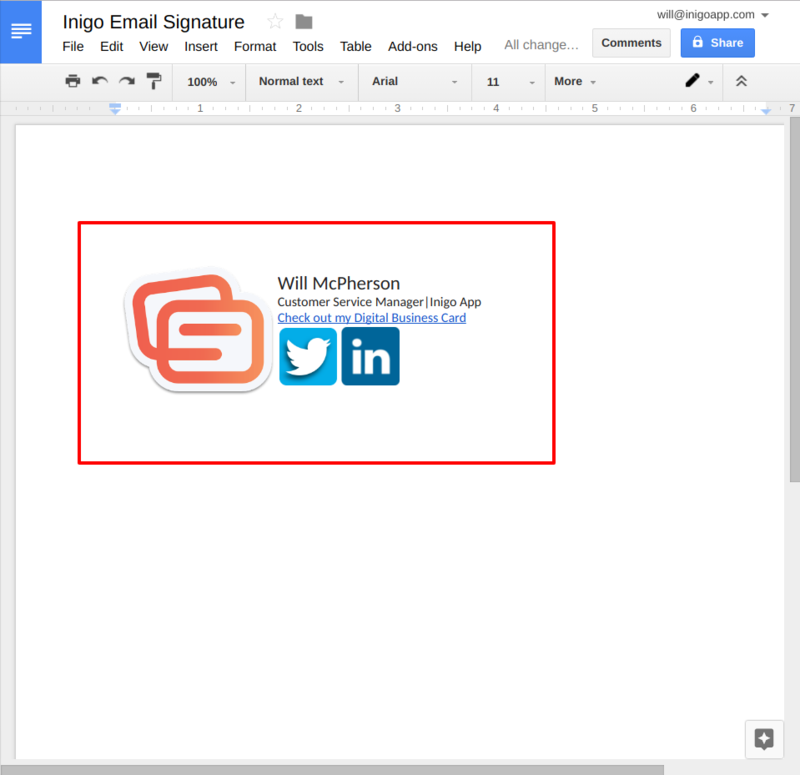 I will also be creating the template for a signature in Google Docs, but you can create the same style in any word processor. Open a word processor, for this example we will be using Google Docs. Choose "insert table" under the "insert" tab. Create a table that is 2x1, or 2 columns and 1 row. For my example, I will fill the right column with my name, position, social media accounts, and the text that will become the link to my Inigo card. I will use social media icons, easily found on google images, and right click these icons to turn them into links for my social media accounts. You can resize these images physically by selecting them, just try to make them even! For the left column, I will add a company logo. Again, you can resize this logo physically to meet your needs. Because my digital business card is for this company, I am going to link that image to the card as well as the text in the right column. I will show you how to do that in the next section. 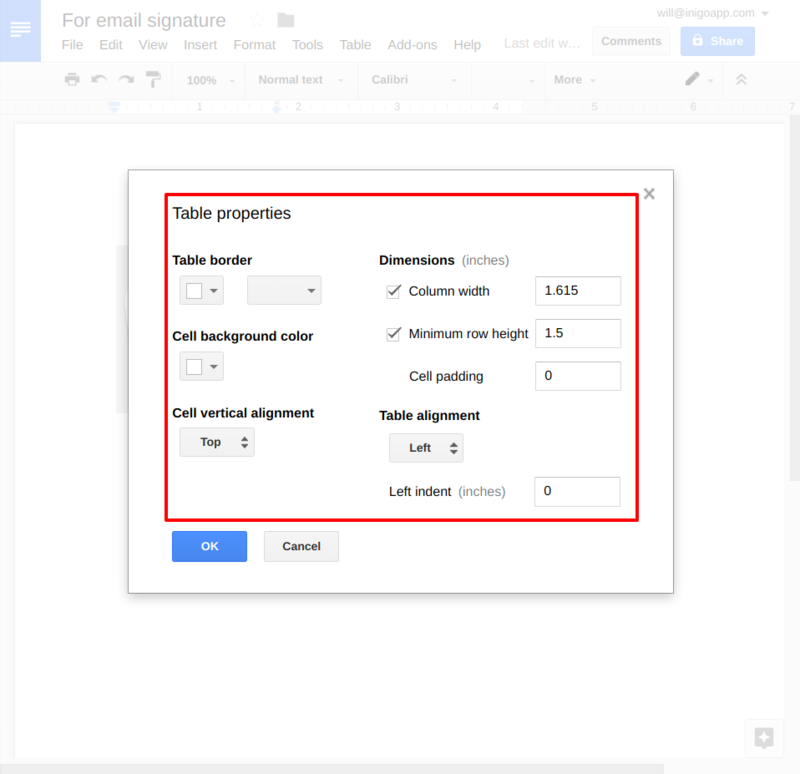 Now that your signature columns are filled, you can change the structure of the table to look better as an email signature. Highlight the table, and select "table properties" under the table tab. Change the table border color to white, as well as the cell background. Change the table border size to 0. Choose top for cell vertical alignment. Change the column width to 1.615, and row height to 1.5. Change the cell padding to 0. Set the table alignment to left. After you have finished your signature should look something like this. Expand the width of any columns physically by hovering over the now invisible border so that the text stays in one line. Now you will need to add your Inigo card to the signature. 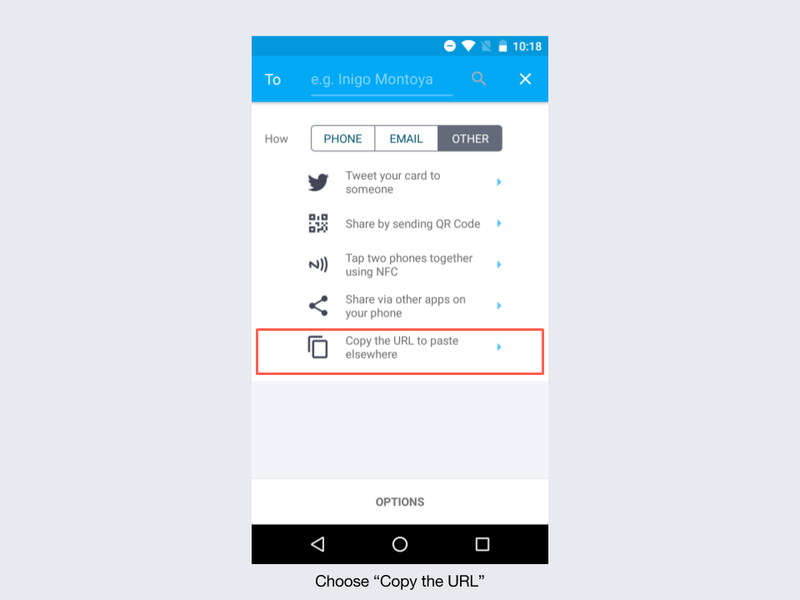 The best way to do this would be to open the Inigo app, and tap share to choose "copy." This will copy the URL to your Inigo card. Send the URL to your email, or save it in a repository that you can access on your computer. 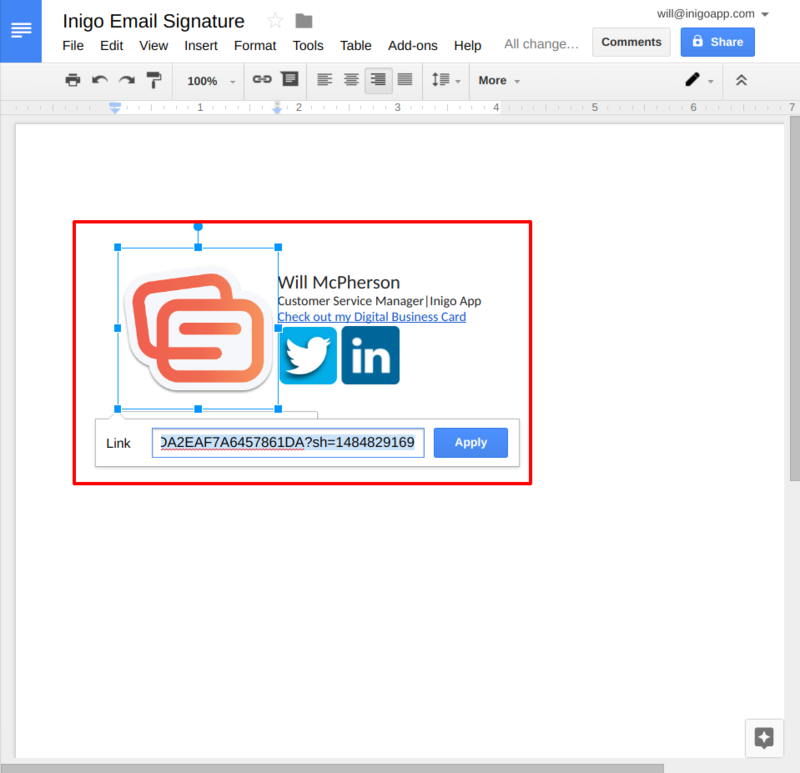 Once you have copied the URL, open your email signature document. Just as you inserted links for the social media icon images, highlight the text that says "View my digital business card," right click and select link. 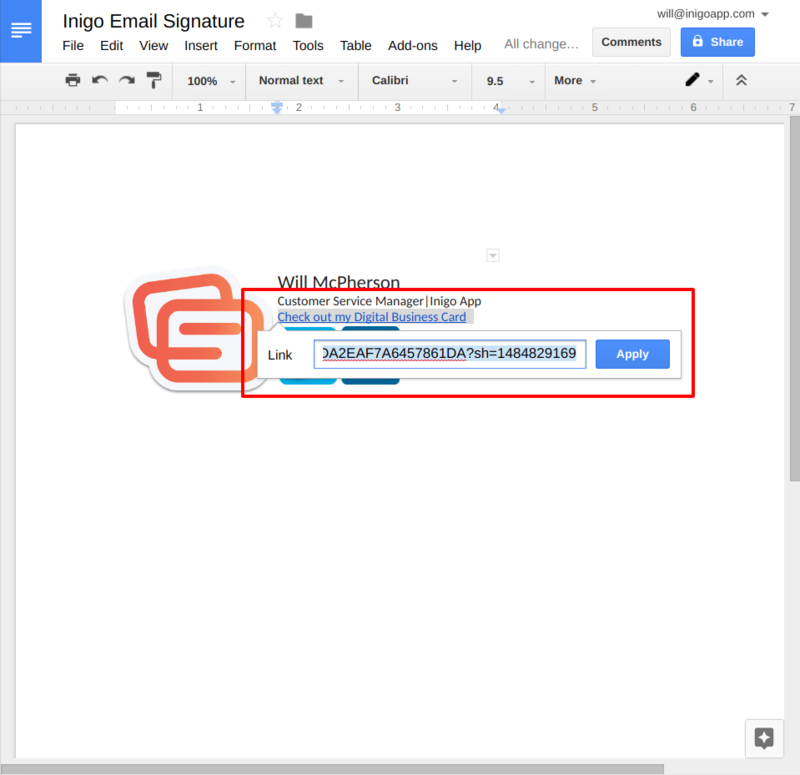 Paste you Inigo card URL to create a hyperlink. Because my Inigo card corresponds with the company logo that I placed in the left column, I am going to turn this image into a hyperlink for the card as well. 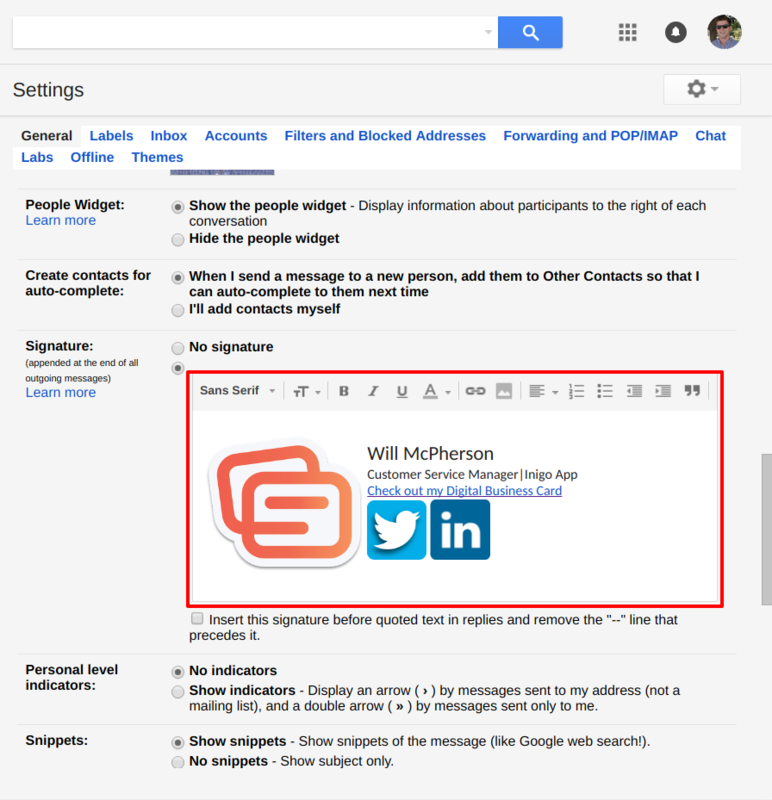 To past the final product into your email signature, go to your Gmail settings by clicking the gear symbol on your inbox page and choose settings. Scroll down until you see "signature." Copy the contents of the table on your document by clicking and highlighting the entire inside of the table. Hit copy in order to copy just the inside of the table, and not the exterior formatting. 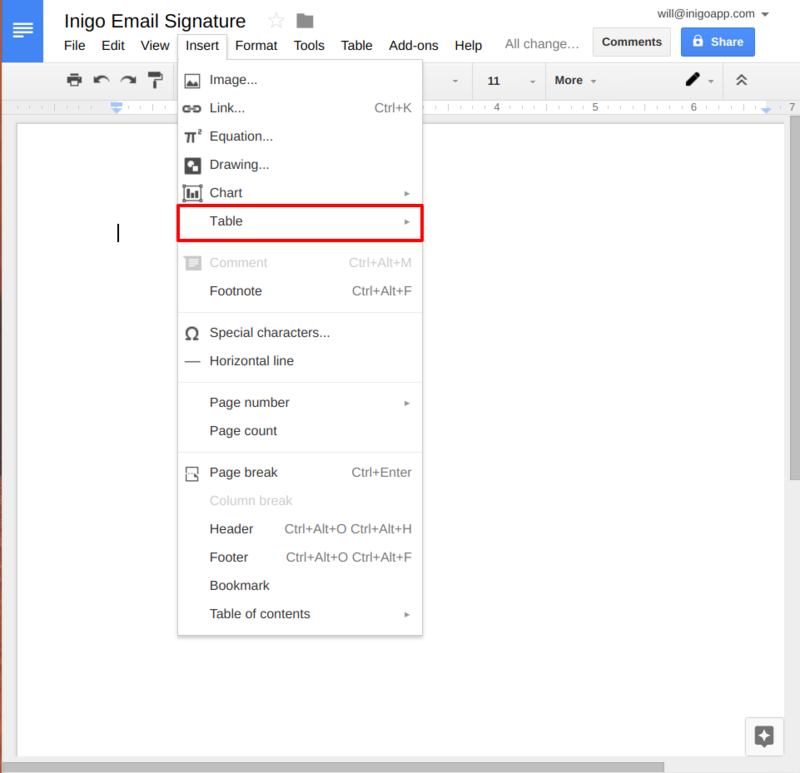 Go to the signature section of your Gmail settings, and paste the signature inside of the box. There may be a space on the top of the signature, click to the far left of the table and hit delete to remove this. In some cases, a space may be deleted within the signature and you will have to go add one. Make sure that the underline format is not selected, Gmail will sometimes auto-select this. 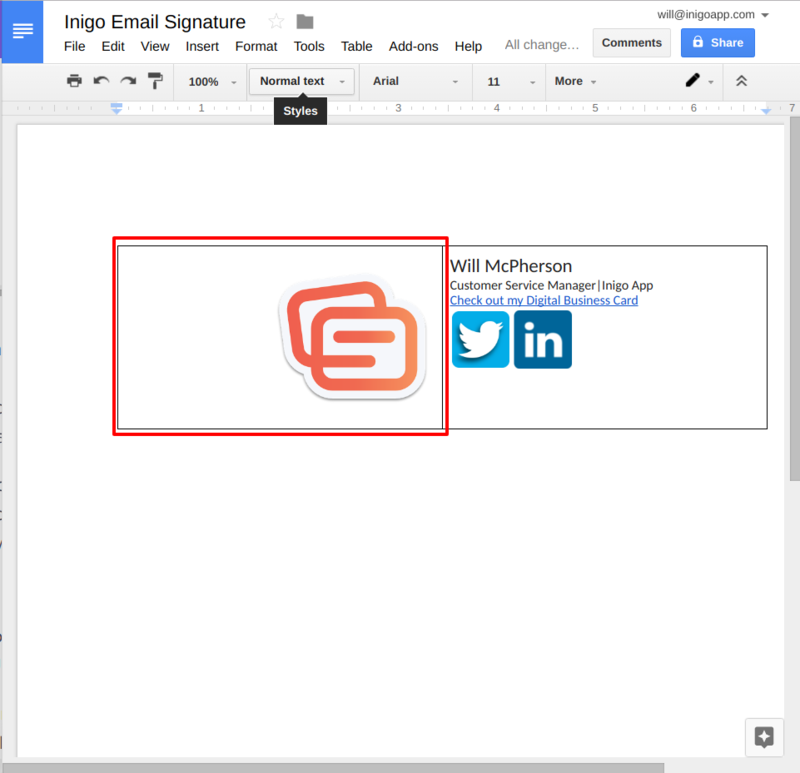 Hit save on this page, and enjoy your new email signature with your awesome Inigo card! Now when you send an email your contacts and leads can view all of the marketing and sales elements that are contained on your digital business card!